Like many of the people who grew up in this area, I have many experiences tied to The Big E. Unlike most people, my experiences are not the norm for the average fair goer. My early memories are when my dad worked for Western Mass Electric Co. and manned the Totally Electric Home display housed in the Better Living Center. It was fun to hang out with Dad in that attractive, modern model home. By the end of the week, it felt like I lived there. Then there came the two times when I actually did live there. In those days, it was called the Eastern States Exposition, because it was big and it was grand. As a member of the 4-H Baby Beef Club, I raised a Black Angus steer two years in a row. They were black and fuzzy and I watched them grow for a year from calves to beef for market. Raising beef is just another thing we did, living on our little farm in Southwick. No questions asked. I daily fed and watered them and cleaned out their pen. I enjoyed hugging their cute black heads and looking into their big blue eyes with those enormous thick, black eyelashes. I named them after my favorite TV characters at the time. My first steer was “Maynard G. Krebs” from The Dobie Gillis Show and my second steer was “Benny” from Top Cat. I watched them grow into enormous animals. When September rolled around, I felt pretty lucky to get out of school during the fair and sleep in The Moses Dormitory on the fair grounds. My steer stayed in the big cattle and horse barn with all the other show animals. I felt pretty important living there among all that fair excitement. Then the day came for the big Beef Show, so I shampooed my more than 1,200 pound steer and then I followed the combing specs. I don’t know who designed the steer hair-do but he has to be combed down straight and flat on his front end and on his back end. Then a round, metal curry comb is used upward in his mid-section giving him a fluffy furry look around his belly. It’s supposed to make him look desirable to the judge. Like all the other 4-Hers, I also applied black shoe polish to my steer’s four hooves and buffed them. After all, this was The Show! I dressed myself in the required white shirt and white slacks and showed my steer along with all the other thirty or so 4-H Baby Beef Club kids in the big sawdust ring of The Coliseum Building. I’ve never had a competitive spirit. I just do things for the joy of it. So even if I did get the memo on “Judge Signals in the Show Ring,” chances are I didn’t read it. So, I missed all those subtle finger movements and stealthy head nods from the judge and proved that I was lacking all showmanship savvy, but I was OK with that. I just enjoyed raising my steers. They were like big dogs and I was attached to them, which is why the dreaded auction was such a disaster for me. Leading my big furry buddy through the auction was a miserable experience. I walked him around and around the ring in tears as I heard “Who’ll give me…” price per pound figures being rapidly shouted by the auctioneer. When I left the auction ring, Dad hugged me and I sobbed all over his nicely starched white shirt. My steer was headed to the slaughter house and people were going to eat him. Doing this thing a second time did not make it any easier for me. I felt like a traitor. Clearly I was not cut out to be a subsistence farmer or any farmer for that matter. So on the second year of enduring the auction and Dad having his shirt soaked with my tears, Dad very wisely announced that there would be no more steers in my future. I was relieved. 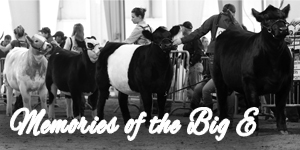 These sad endings to raising baby beef took away the joy of the fair for me. I didn’t care to go back for years. Well time heals and times change. When my husband and I had our first child, that old love for the fair resurfaced. So my husband carried our little ten month old son stuffed in the backpack carrier and off our little family went to The Big E. It was such a delight to see all the festivities reflected in our son’s wide eyes of wonder! As the years went by, we watched with parental love as our son and daughter would take their annual ride together on The Bees. Sweeping upward and dipping back down, their little blonde heads bobbed as they gripped the bar in front of them. Occasionally they would risk the danger of letting go to wave to us as they flew by. My favorite ride as a young mom was the Merry-Go-Round. Standing alongside the high, beautiful horses and holding onto our daughter as she would grasp the brass pole, together we would ride in circles, hoping to catch a glimpse of Daddy waving from the crowd. Even as a tiny tot, our son would straddle the Merry-Go-Round horse, grab hold of the brass pole, then follow the pole with his eyes to its top and spend the entire ride focusing on the mechanical gears that caused each horse to go up and down. I had never even seen those gears until I saw them through the eyes of our little son. The many colored lights and pipe organ music and wind blowing through our hair as we whirled round and round on the Merry-Go-Round still holds very warm, fond memories for me. Those were such happy times! As the years went by, our little family developed our own traditions. Our trip to The Big E had to include buying maple men in the Vermont Building, admiring the arts and crafts and checking out all the tractor displays. We had to see the majestic Clydesdale horses, the little chicks hatching out of their shells, and the big sow with her line of rambunctious, head butting, pink piglets. The kids grew. Eventually they went off to the fair with their friends and we no longer enjoyed The Big E as a family. My husband and I went by ourselves, building new traditions for just the two of us. We now enjoy munching on fried foods, getting the famous Big E chocolate eclairs, and listening to music. We’re replacing our family traditions and find that we still have fun at the Big E.